Dr. Nitish Gangoli is a New Jersey native, and proud to be working and living in the area where he grew up. He attended Boston University, receiving a B.A. in Biochemistry and Molecular Biology. He then earned a Master’s degree from UMDNJ, followed by a DMD degree from UMDNJ – New Jersey Dental School, currently part of Rutgers University. Dr. Gangoli then did an internship at Rutgers School of Dental Medicine, and completed his residency in Oral and Maxillofacial Surgery at Christina Care Health System in Wilmington, DE; acting as chief resident in his final year. His surgical training incorporated the full scope of Oral and Maxillofacial Surgery, including dentoalveolar surgery, bone grafting and implants, outpatient anesthesia, facial trauma, orthognathic surgery, and head/neck pathology. He is a member of the American Association of Oral and Maxillofacial Surgeons, and has presented research on a national level. 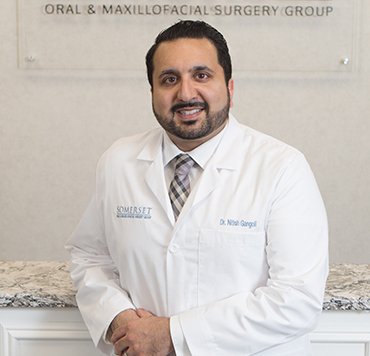 Outside the office, Dr. Gangoli enjoys spending time with his wife and kids, discovering new restaurants, watching and playing tennis, and getting to know his new community and surroundings. Whether you’d like to find out more about a specific procedure or are ready to schedule, we are here to help.